Railpictures.ca - Bill Thomson Photo: Amtrak F40PH 347 leads a baggage car and six Amfleets on today’s “Maple Leaf”, arriving at the station in Grimsby on August 11th 1981. At the time, part of the station was occupied by Keystone Kelly’s restaurant. Unfortunately, Grimsby Station would be destroyed by fire in 1994. | Railpictures.ca – Canadian Railway Photography – photographie ferroviaire Canadienne. Caption: Amtrak F40PH 347 leads a baggage car and six Amfleets on today's "Maple Leaf", arriving at the station in Grimsby on August 11th 1981. 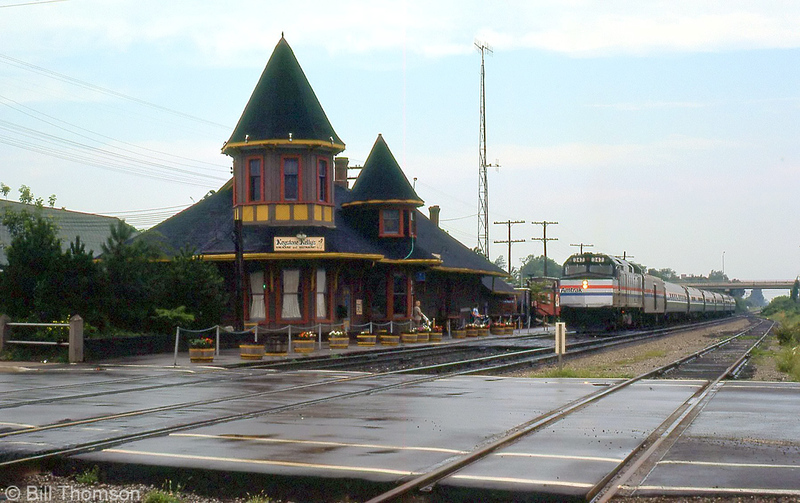 At the time, part of the station was occupied by Keystone Kelly's restaurant. Unfortunately, Grimsby Station would be destroyed by fire in 1994.